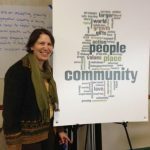 Leadership Development Consultant, Central East Regional Group (CERG) of the UUA. I have a vision of Unitarian Universalist congregations being led by thousands of diverse, spiritually mature and passionate people ready and willing to spread the good news of liberal religion. I believe ministry is best when shared between lay and professional leaders. More information about me can be found on the UUA website.